ZZ Top is an American rock band from Houston, Texas. Formed in 1969, the group consists of Billy Gibbons (guitar and vocals), Dusty Hill (bass and vocals), and Frank Beard (percussion). ZZ Top's early sound was rooted in blues but eventually grew to exhibit contemporary influences. Throughout their career they have maintained a sound based on Hill's and Beard's rhythm section support, accentuated by Gibbons' guitar and vocal style. Their lyrics often gave evidence of band's humor and thematically focus on personal experiences and sexual innuendos. ZZ Top formed its initial lineup in 1969, consisting of Anthony Barajas (bass and keyboards) and Peter Perez (drums and percussion). After several incarnations, Hill and Beard joined within the following year. Molded into a professional act by manager Bill Ham, they were subsequently signed to London Records and released their debut album. They were successful as live performers, becoming known to fans as "that little ol' band from Texas", and their 1973 album Tres Hombres, according to Allmusic, propelled the band to national attention and "made them stars". In 1979, after returning from a one-and-a-half year break of touring, the group reinvented themselves with their hit album Degüello and the accompanying tour. ZZ Top incorporated New Wave and punk influences into their sound and performances, and embraced a more iconic image, with Gibbons and Hill sporting chest-length beards and sunglasses. Similar experimentation continued for the remainder of the 1980s and 1990s with varying levels of success. 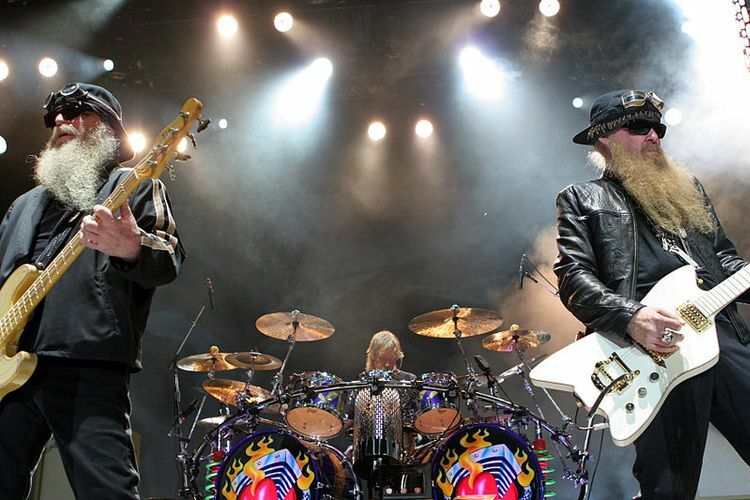 On ZZ Top's 2003 album Mescalero, they adopted a more contemporary sound while maintaining their influences from their earlier musical pursuits. Maintaining the same members for over forty years, ZZ Top has released 14 studio albums and are among the most popular rock groups, having sold more than 50 million albums worldwide,half of this figure concerning the United States alone. They have won three VMAs, and in 2004, they were inducted into the Rock and Roll Hall of Fame. VH1 ranked ZZ Top at number 44 in its list of the "100 Greatest Artists of Hard Rock". They have performed at many charity events and raised $1 million for the Delta Blues Museum in Clarksdale, Mississippi.